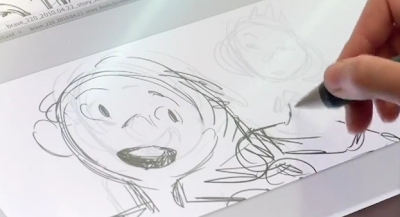 New videos featuring B-roll footage of behind-the-scenes look at the making of Brave have just been released via YouTube. If you are a fan of how the amazing team at Pixar creates their magic, you'll love these clips! *Spoiler Alert - these three clips may contain a few spoilers, please forgo watching these clips if you want to be surprised on June 22. In the first video, you will get a glimpse of the actors lending their voices to the characters we will meet on June 22. The second video shows more voice work as well as a look at the music of Brave, however this clip has a very loud soundtrack added and I find it distracting. The third video is my favorite as it shows a lot of raw animated footage as well as Director Mark Andrews lending a hand at sketching a scene.